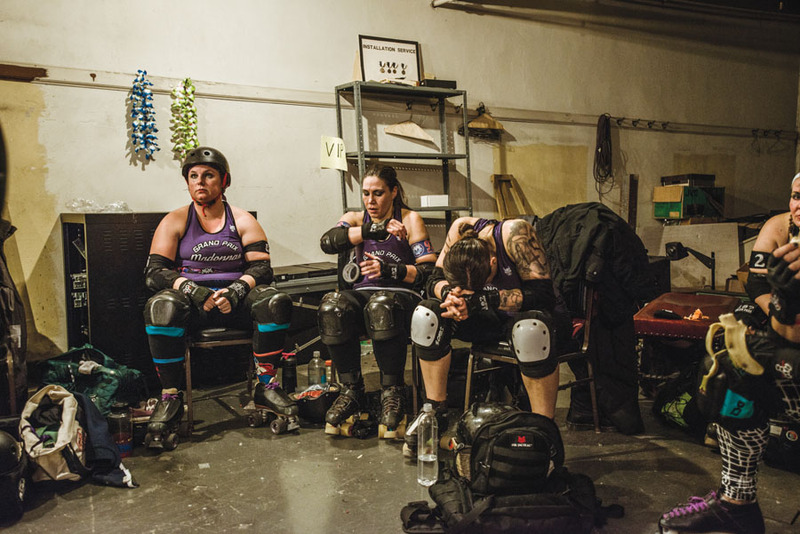 Inside the “locker rooms” on the third floor of the Masonic Temple, the Grand Prix Madonnas and the Devil’s Night Dames are getting psyched up. Tonight’s game is only the third of the season for the Detroit Roller Derby league, and fans have been encouraged to wear costumes for the Heroes vs. Villains-themed bout. The teams include women varying in ages and races — and attitudes. Thomas’ team isn’t playing tonight, but league members are encouraged to volunteer at events. A heavy wooden door is painted with “Damascus Commandery Locker Room 3” in gold, fading letters. Inside, the Grand Prix Madonnas sit in a circle gearing up. 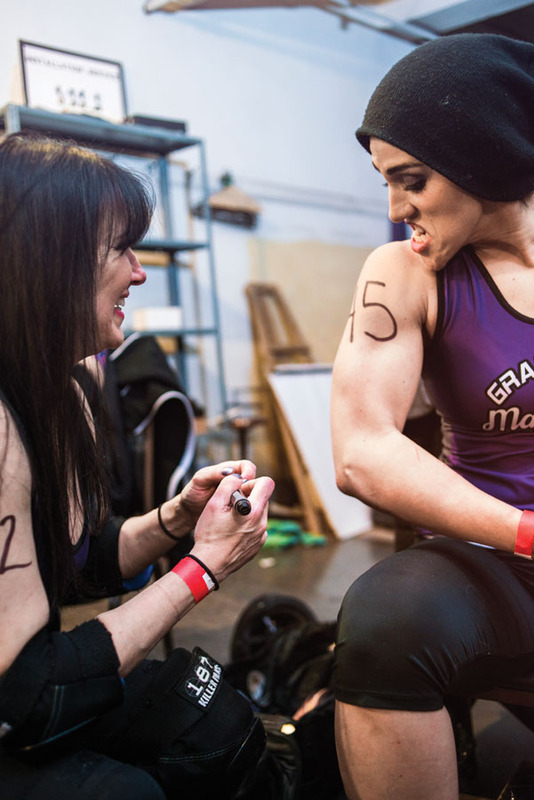 Players scrawl on their arms with black felt-tipped marker, sketching their number on their biceps. Some players are laughing; two are fixing their makeup in a foggy, ornate mirror in the corner. Others quietly put on their elbow pads, aloof from their surroundings. The Grand Prix Madonnas hold a reputation of being one of the most “spirited” teams in the league. “You don’t get along with everybody. That’s a fact,” says Jennifer “Nuke Town 2025” McIntosh. “You may not like everybody, but when you get on the track, especially if they’re on your own team, they’re your teammate. Period. “If you’re really good friends and they’re on the other team, when it comes to gameplay, you are not friends,” she says with a laugh. A high level of camaraderie is common. 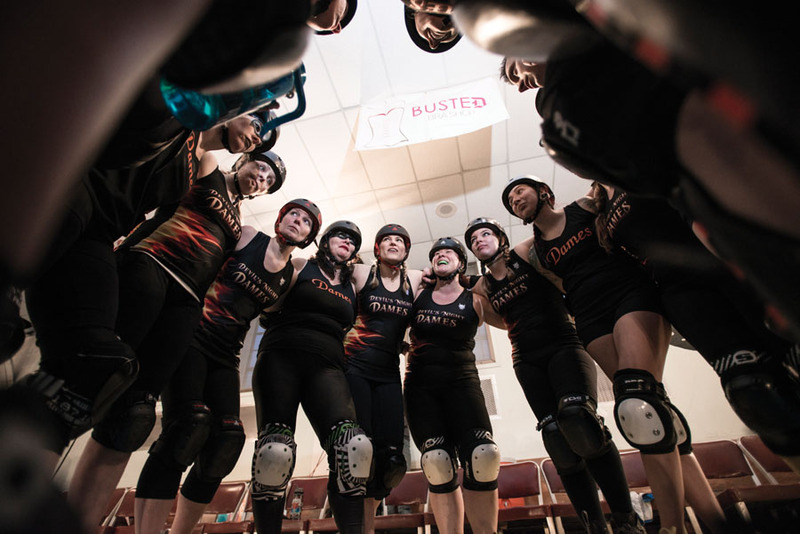 “I think the best thing about roller derby and the community that you have is just the amount of support and connection that you get from such a diverse group of people,” says Melissa Ricketts, aka Calamitous Intent. Ricketts started playing for a Brighton league in 2011, where she met her now-husband and derby announcer Phillip Perkins, aka Handle Barbarian. 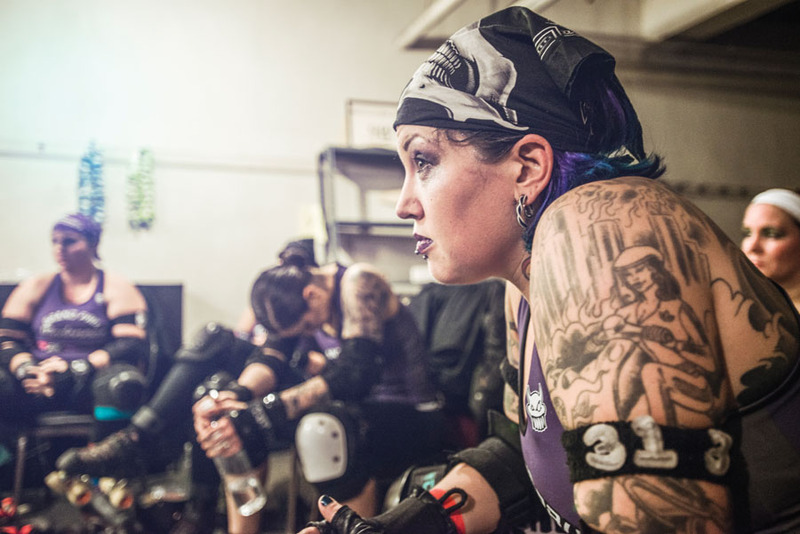 She came to the Detroit league in 2015 and is on the Devil’s Night Dames. 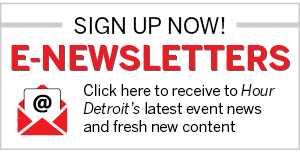 The past year marked many changes for the Detroit league, founded in 2005. This season, the Detroit Pistol Whippers, one of the original home teams, was dissolved, causing players and coaches to be shuffled around to different teams in the league. 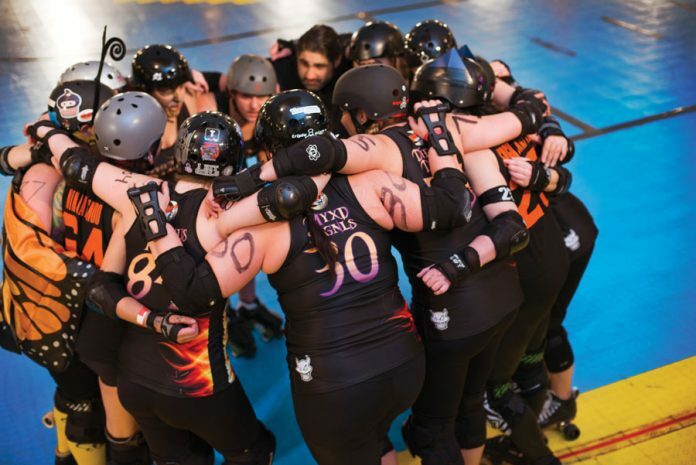 In January, the league (previously Detroit Derby Girls) officially became the Detroit Roller Derby after becoming affiliated with the Detroit Men’s Roller Derby League. There are four home teams — the Grand Prix Madonnas, the Devil’s Night Dames, the D-Funk All Stars, and the Detroit Pistoffs — plus three travel teams and “rec” and junior leagues. “This change is quite progressive,” says Sarah Hipel, who plays for the All-Star Team. “We’re actually only the second team in the world to make a move like that.” The men’s league hopes to achieve full Men’s Roller Derby Association status soon. Back in the Grand Prix Madonnas’ locker room, Simone calls the players to gather in the center of the room, hands in. “Loud and proud. Loud and proud,” he repeats. “Prix!” they shout in unity. The door swings open and players pile out. Opposing team members pass each other in the halls. Some laugh and skate together, friends until the first whistle. Players holler as they make their way up the steep ramp, entering a hall filled with cheering fans and pump-up music. 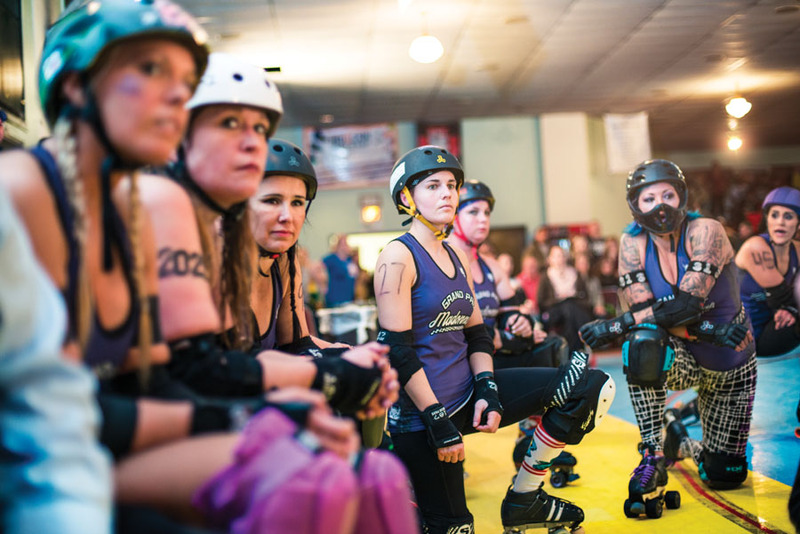 Understanding the rules of roller derby can seem daunting, especially with the quick pace of the game. Simply put, both teams are simultaneously playing offense and defense. 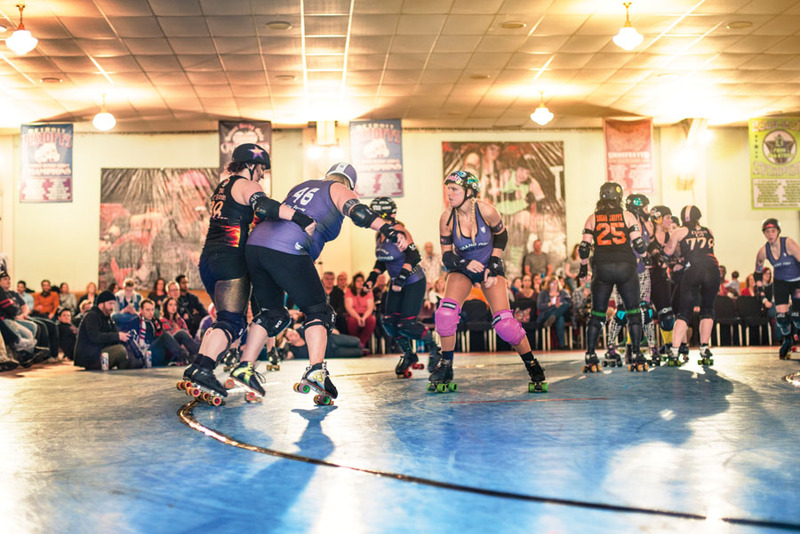 During each “jam,” both teams deploy a sprinting skater called a jammer (marked by a star on their helmet), who tries to score as many points as possible by lapping the other team’s blockers. Blockers on both teams attempt to prevent the other team’s jammers from passing the pack. The game is played with two, 30-minute halves, broken into 2-minute jams. There is also a strict set of blocking and target zones. Anywhere from torso to the biceps is kosher for blocking players. Blocking with elbows or forearms is prohibited, as is grabbing, pulling, or intentional tripping. At first, watching the action can be a bit intimidating, and admittedly confusing. During bouts, members of teams not playing that evening make the rounds sporting “ask me about derby” signs, happily answering questions. Programs for each bout go into detail explaining the rules and decoding the referee’s hand motions. As the players make their way into the hall, the old wooden floor shakes, thumps, and creaks under their wheels. A four-piece jam-band grooves in the corner while a middle-age man dressed as Prince dances on the sidelines. The floating floor is laid on felt, only one of three in the United States, and gives a particular bounce to each step as patrons take their seats, admiring skaters whizzing around the track. After a few more minutes of last-minute stretches and the National Anthem (highlighted by a league member dressed as Marvel’s Black Cat running around the track with an American flag), the first lines of players take their positions. Four players from each team take the front, while one from each team skates to the back of the line. With a single blow of the whistle, they’re off, pushing, shoving, and slamming their skates into the thinly padded, circular track. Soon, a nasty hit takes Con-Yay (Connie Smith) of the Madonnas to her knees. She holds her face as officials rush over and players take a knee. She’s quickly escorted off the mat, and the bout continues. Despite the fierce gameplay and rowdy audience, the faces of experienced players are almost passively stern, their minds fixed on the game. Success is reliant on mental toughness, shutting yourself off emotionally. Kaniaris, who grew up watching her mother play roller derby, says this mental toughness developed with her skating abilities. Veteran skaters like Hipel are a testament to the importance of this sort of skill. The 34-year-old served as co-captain of a team in Austin, Texas, that was ranked among the top five women’s teams in the world before returning to Detroit last year. Hipel also plays internationally for Team Canada, which was chosen to compete for the World Cup. The international competition has been held twice since 2011. The next one is scheduled to be played in the United Kingdom in 2018. Back in the game, the first three points are quickly scored by the Grand Prix Madonnas. Still, the Devil’s Night Dames take an early lead in the first period. There’s a breakdown in communication between players, and frustration begins to mount on the Madonnas’ side. Emotions grow fierce. “Skate slow!” Simone yells from the bench. After a questionable call, he storms onto the track, challenging the referee. 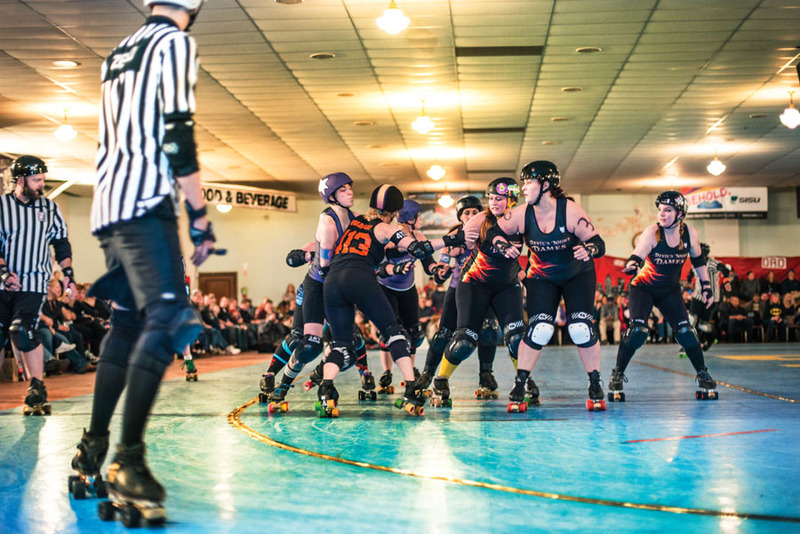 The jammers from the Devil’s Night Dames continue to pass up the pack. The half ends with almost a 50-point lead by the Devil’s Night Dames. The teams roll back down the ramp and into their locker rooms, behind closed doors. The halftime scene in the Grand Prix Madonnas locker room is intense and quiet. Players breathe heavily, faces wet and red, eyes tired and smeared with makeup. “I need you guys to listen,” starts Simone. “I very rarely do what I’m about to do. I will take responsibility for that first half. “You guys are better than this,” Simone continues. Kathryn Prater, aka Lazer Beam, rolls over to a trash can and vomits. Players stare forward, absorbing the comments from the managers and other players, forming a game plan for the second half. When tempers flare like they did in the first half, team performance is negatively affected. It’s in situations like these where the bonds between players matter most. “When you see your teammates going down that hill, you really just got to try and build them back up,” says McIntosh. This means each member, down to individual players, has a say in the decision-making process, while also agreeing to comply with the policies set forth by the organization. This includes standards, rules, and safety guidelines for national and international competitions. 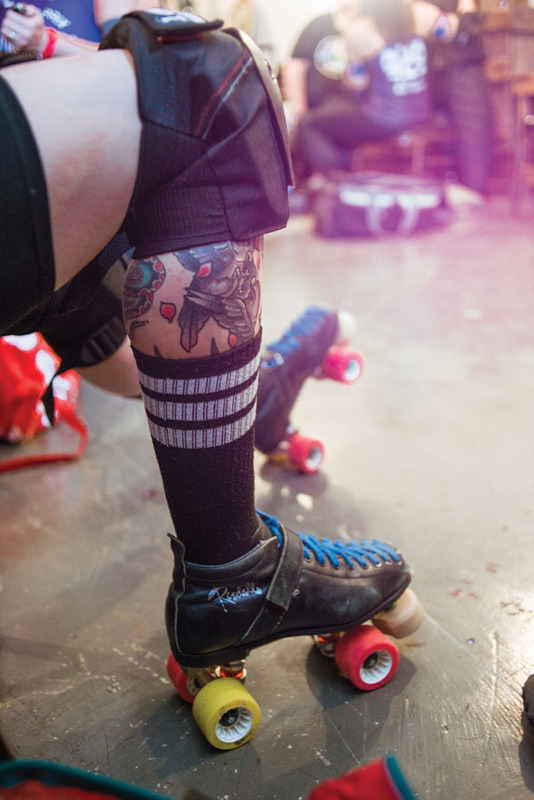 The WFTDA serves as the governing body for nearly 400 full-member leagues and over 60 apprentice leagues in training to become full members. Leagues hail from countries all over the world, such as Argentina, Colombia, Brazil, Australia, Belgium, and the U.K.
Every league follows the same guidelines. They must be owned by a majority of women skaters, abide by democratic principles and practices, and be managed by at least 67 percent league skaters. Every aspect of roller derby relies on teamwork and collaboration between players and officials. After Simone wraps up his locker-room speech, the Madonnas take the center of the room once more, hands in the center. “Loud and proud,” Simone recites. “Prix!” responds the team, resetting their attitude and entering the next half with a specific, unified game plan in mind. The second half goes quickly. The Grand Prix Madonnas have a gap to close — and something to prove. The hits get harder and so do the falls. They put up four points in the first jam. Madonnas member Amanda Misisian, aka Feta Sleeze, pulls out all the stops. She cuts through the opposing team’s blockers and exploits every open hole she can find to pass up the pack — scoring 12 points in a single jam. Halfway through the period the Madonnas have put up 47 points to the Devil’s Night Dames’ 24. There’s still a small gap to be closed. The walls of blockers from the Dames grow tighter and tighter. Lazer Beam bursts through, scoring a point completed by a heavy hit throwing her to her stomach. Feta Sleeze takes the floor. Only 12 points separate the teams going into the final jam, still favoring the Devil’s Night Dames. Feta Sleeze takes her position once more, jamming back-to-back periods. The crowd grows louder and louder as she hugs the inside and outside lines, hopping over players. She rounds the curves at a breakneck speed, closing the gap and taking the lead. “End the jam! End the jam!” scream fans from the sidelines. A jammer can end the period with a repeated slapping motion on her hips to the refs, but it’s still too close of a game. The jammer for the Devil’s Night Dames is quick on Sleeze’s tail and beginning to pass. She rounds the rink one more time before the two-minute period ends. The scoreboard reads 160-161. Officials check each point in detail in the middle of the track. The crowd holds their breath, the most silent they’ve been since the bout began. The officials quickly come to a decision. The Devil’s Night Dames have beaten the previously undefeated Grand Prix Madonnas by a single point. For the Grand Prix Madonnas, the match didn’t have a perfect fairytale ending — but then again, real sports stories seldom do. And make no mistake, this is a real sport — an internationally recognized test of athleticism. It’s blood, sweat, and tears. It’s warfare on four wheels.